Alchemical symbols used to denote sal ammoniac. Today we will examine "sal ammoniac," a common alchemical ingredient used by Antonio Neri in many of his preparations. In its pure form, it is a colorless crystalline material and is known to chemists as ammonium chloride. 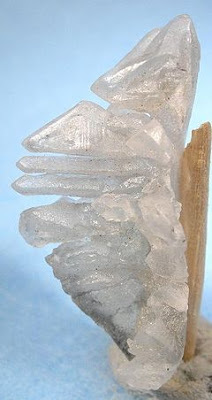 It does occur as a (rare) natural mineral, but it was also manufactured as early as the thirteenth century, as noted by alchemist Albertus Magnus in his De alchymia. Neither he nor Neri provides a recipe for sal ammoniac, but other sources indicate that it was made by allowing urine to putrefy with common salt. French investigators documented another method used in Egypt in the eighteenth century. This scheme involved burning the dung of animals who fed on spring grasses and then sublimating the ammoniac out of the resulting soot. Sublimation occurs when a heated material goes directly from a solid to a gaseous state without ever becoming liquid. Sal ammoniac has this property; when heated it turns to a gas and upon cooling, turns back to a solid. Another of Neri's creations requiring sal ammoniac was Chalcedony glass. 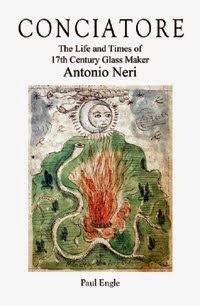 It had swirls of every color the glassmaker could produce. He achieved this feat by making extensive use of aqua regis to dissolve each of a long list of metals. He then gently evaporated off the acid, leaving ultrafine powdered metals, which he added as pigments to the glass melt. * This post first appeared here on 22 August 2014.